N'Golo Kanté proved he is not just a good footballer but also a brilliant human being after a short story about the Chelsea midfielder has gained attention on social media. Aside from being a world-class footballer, the 27-year-old has established a firm reputation of being a great person off the pitch too. Despite winning two Premier League titles with Leicester City and Chelsea respectively coupled with being crowned a World Cup winner over the summer with France, Kanté sounds about as humble as a footballer can be. It appears as though despite Kante's allegiance to Chelsea, he has the ability to charm fans of any club as told by Arsenal fan @AFCSharky. Chelsea survived an Arsenal comeback to win 3-2 in a thrilling Premier League encounter at Stamford Bridge on Saturday evening. 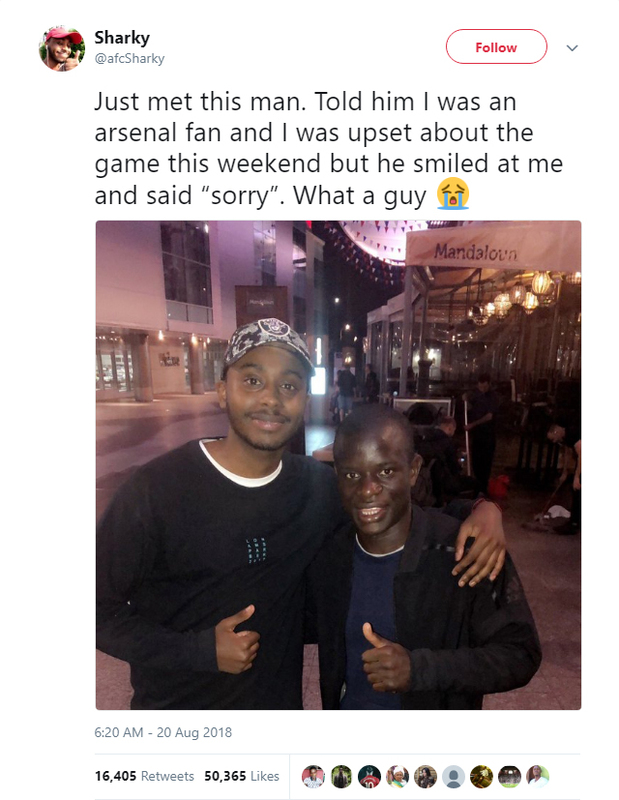 Understandably, Gunners fans were left close to tears following the derby defeat, but one supporter has revealed how he bumped into Kanté at Westfield shopping centre with the Frenchman apologising for inflicting a defeat on his beloved Arsenal.